منطقه سه‌هزار در جنوب شهرستان تنکابن در استان مازندران واقع شده است که در نزدیکی کمربند طارم – هشتجین قرار دارد، وجود توده گرانیتوییدی در منطقه می‌تواند از نظر پتانسیل کانی‌زایی دارای اهمیت باشد. تکنیک زمین‌آماری کریجینگ با استفاده از داده‌های موجود و همبستگی فضایی بین آنها که توسط واریوگرام توصیف می‌شود، برای پیش‌بینی توزیع عیار به کار برده می‌شود. برای مشخص کردن مناطق آنومال از 50 نمونه آبراهه‌ای استفاده شد که به روش ICP-MS تجزیه شدند. ابتدا داده‌ها نرمال شدند و پس از نرمال‌سازی از آنالیز زمین‌آماری استفاده شد. مطالعات واریوگرافی نشان داد که مدل کروی بهترین مدل برازش داده شده و دامنه وابستگی مکانی برای سه عنصر Au ،Cu و Fe تقریباً 350 متر و برای W تقریباً 700 متر است. در نهایت نقشه‌های تخمین و واریانس تخمین کریجینگ عناصر مورد مطالعه با استفاده از روش زمین‌آماری کریجینگ نقطه‌ای با مدل کروی در محیط نرم‌افزار +GS تهیه شد. ارزیابی نتایج با محاسبه مجذور میانگین مربعات خطا (RMSE) و محاسبه میانگین خطا (MAE) نشان‌دهنده دقت قابل قبول مدل واریوگرام است. با بررسی نقشه‌های تخمین کریجینگ و واریانس تخمین کریجینگ، مناطق آنومال برای عناصر Au ،Cu ،Fe و W در منطقه مورد مطالعه معرفی شدند. با توجه به همبستگی مکانی عناصر این نتیجه به دست می‌آید که این توده‌ می‌تواند با ذخایر آهن- طلا- مس مرتبط باشد. Application of geostatistical studies for Identification of Au-Cu-Fe-W Anomalies in the Sehezar Valley of Tonekabon – Northern Iran. Sehezar area is located in southern city of Tonokabon in Mazandaran province in north of Iran, and near the Tarom – Hashtjin belt. The existence of granitoid masses in the region can be important in terms of the potential of mineralization. The kriging geostatistical technique is used to predict the grade distribution, by using existing data and spatial correlation between them, which is described by the variogram. To identify the anomalous area, 50 stream sediment samples were collected from the area and analyzed by the ICP-MS method, and then interpreted. At first, the data were normalized and then the geostatistical analysis was used. Variogram studies showed that the spherical model is the best fitted model, and the spatial correlation range for the three elements of Au, Cu and Fe are approximately 350 m and for W is approximately 700 m. Finally, the estimation and estimation variance maps of the studied elements were prepared by using ordinary kriging geostatistical method with the spherical model on the GS+ software. Evaluating the results by calculating the root mean square error (RMSE) and calculating the mean absolute error (MAE) indicates the acceptable accuracy of variogram model. By studying the kriging estimation and kriging estimation variance maps, the anomal regions were introduced for the elements of Au, Cu, Fe and W in the case study. Due to the spatial correlation of the elements, it is concluded that this mass can be associated with iron-gold-copper deposits. حسنی‌پاک، ع. ا. و شرف‌الدین م.، 1380- تحلیل داده‌های اکتشافی (جدایش زمینه از آنومالی، آمار و احتمال مهندسی، تخمین ذخیره)، انتشارات دانشگاه تهران. رضوانی منظری، م.، 1393- مطالعات و بررسی لیتوژئوشیمیایی و ژئوشیمیایی آبراهه‌ای محدوده گرانیت بالای دره سه هزار- تنکابن، پایان‌نامه کارشناسی ارشد، دانشگاه صنعتی امیرکبیر. شرکت مهندسن مشاور کاوشگران، 1393- اکتشاف نیمه تفصیلی در منطقه آرود دره سه هزار تنکابن. شرکت مهندسین مشاور معدن کاو، 1377- پی‌جویی و بررسی لیتوژئوشیمیایی و ژئوشیمیایی آبراهه‌ای منطقه آرود. قربانی سمسوری، م.، 1393- مطالعات و بررسی لیتوژئوشیمیایی و ژئوشیمیایی آبراهه‌ای محدوده گرانیت پایین دره سه هزار- تنکابن، پایان‌نامه کارشناسی ارشد، دانشگاه صنعتی امیرکبیر. 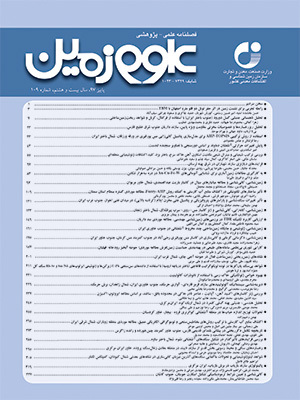 مدنی، ح.، 1373- مبانی زمین آمار، انتشارات دانشگاه صنعتی امیرکبیر واحد تفرش، 659 ص. هاشم­پور، م.، 1390- پی‌جویی و پتانسیل‌یابی مواد معدنی منطقه آرود دره سه‌هزار تنکابن. Choi, W., Galasinski, U., Cho, S. and Hwang, C., 2012- A spatiotemporal analysis of groundwater level changes in relation to urban growth and groundwater recharge potential for Waukesha County, Wisconsin. Geographical Analysis, 44, 219–234. Coakes, S. J. and Steed, L., 2009- SPSS: Analysis without anguish using SPSS version14.0 for Windows John Wiley and Sons, Inc.
Dengiz, O., Özyazici, M. A. and Salam, M., 2015- Multi-criteria assessment and geostatistical approach for determination of rice growing suitability sites in Gokirmak catchment. Paddy and water environment, 13(1), 1. Goovaerts, P., 1999- Geostatistics in soil science: state-of-the-art and perspectives. Geoderma, 89(1), 1-45. Hassani pak, A. A.. 1998- Geostatistics. Tehran University Press, 314p. Jiachun, S., Hazian, W., Jianming, X., Jinjun, W., Xingmei, L., Haiping, Z. and Shunlan, J. 2006- Spatial distribution of heavy metals in soil: A case study of Changing, China. Environ ment al Geology Geol, 10:245-264. Marko, K., Al-Amri, N. S. and Elfeki, A. M., 2014- Geostatistical analysis using GIS for mapping groundwater quality: case study in the recharge area of Wadi Usfan, western Saudi Arabia. Arabian Journal of Geosciences, 12(7), 5239-5252. Meli’I, J. L., Bisso, D., Njandjock Nouck, P., Mbarga, T. N., Mbanga, A. F., Manguelle-Dicoum, E., 2013- Water table control using ordinary kriging in the Southern part of Cameroon. J Appl Sci 13(3):393–400. Nikroo, L., Kompani-Zare, M., Sepaskhah, A. R. and Shamsi, S. R. F., 2010- Groundwater depth and elevation interpolation by kriging methods in Mohr Basin of Fars province in Iran. Environmental Monitoring and Assessment, 166, 387–407. doi:10.1007/s10661-009-1010-x. Njandjock Nouck P., Yene, A. Q., Amougou, L, Lissom, P. and Mbida, Y., 2013- Geoelctrical prospection of aquifers in Eseka region, Centre-Cameroon. J Emerg Trends Eng Appl Sci (Jeteas) 4(3):471–477. Nshagali, B. G., Nouck, P. N., Meli'i, J. L., Arétouyap, Z. and Manguelle-Dicoum, E., 2015- High iron concentration and pH change detected using statistics and geostatistics in crystalline basement equatorial region. Environmental Earth Sciences, 73(11), 7135. Parsa, M., Maghsoudi, A., Yousefi, M. and Carranza, E. J. M., 2017- Multifractal interpolation and spectrum–area fractal modeling of stream sediment geochemical data: Implications for mapping exploration targets. Journal of African Earth Sciences, 128, pp.5-15. Rabah, F. K. J., Ghabayen, S. M., and Salha, A. A., 2011- Effect of GIS interpolation techniques on the accuracy of the spatial representation of groundwater monitoring data in Gaza strip. Journal of Environmental Science and Technology, 4(6),579-589..
Rakhmatullaev, S., Marache, A., Huneau, F., Coustumer, P. L., Bakiev, M., and Motelica-Heino, M., 2010- Geostatistical approach for the assessment of the water reservoir capacity in arid regions: a case study of the Akdarya reservoir. Uzbekistan Environment Earth Science. doi:10.1007/s12665-010-0711-3. Triki, I., Trabelsi, N., Hentati, I. and Zairi, M., 2013- Groundwater levels time series sensitivity to pluviometry and air temperature: a geostatistical approach to Sfax region, Tunisia. Environmental Monitoring and Assessment. doi:10.1007/ s10661-013-3477-8. Uyan,M., and Cay, T., 2013- Spatial analyses of groundwater level differences using geostatistical modeling. Environmental and Ecological Statistics. doi:10.1007/s10651-013-0238-3. Webster, R. and Oliver, M. A. 2000- Geostatistics for environmental scientists. Wiley press, 271p.